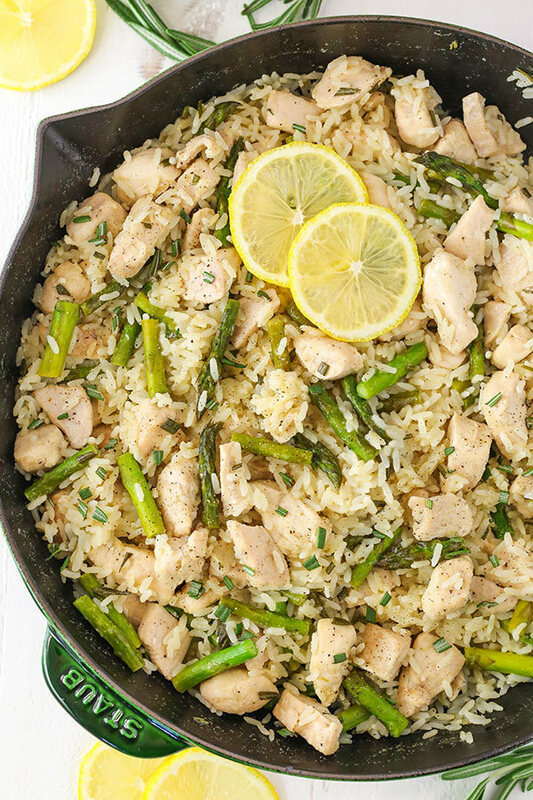 In a large skillet, saute onion in oil until tender. Add the shrimp, green chilies, chili powder, salt, cumin and pepper. Cook for 2-3 minutes or until shrimp turn pink. Stir in cream cheese until melted. Place 1/3 cup shrimp mixture down the center of each tortilla. Roll up and place seam side down in a greased 13×9-in. baking dish. Pour salsa over the top; sprinkle with Monterey Jack cheese. Bake, uncovered, at 350° for 20-25 minutes or until heated through. In a separate bowl, add ½ cup corn starch and flour and mix well. 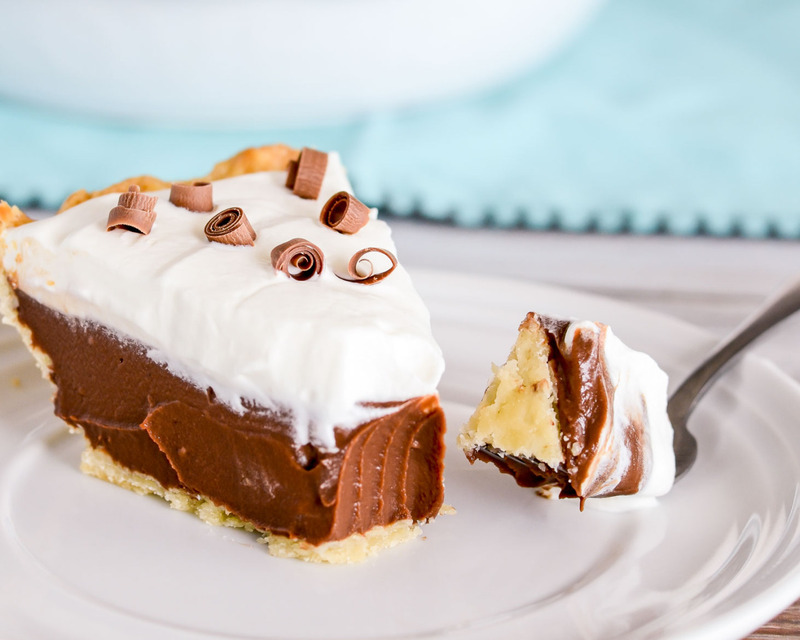 This chocolate cream pie has two types of chocolate in a creamy pudding, topped off with sweetened whipped cream and chocolate curls. Two types of chocolate are used in the homemade pudding, so it has a rich chocolatey flavor. If you like your chocolate more on the mild side, you could use milk chocolate chips, or omit the cocoa powder. It’s up to you. 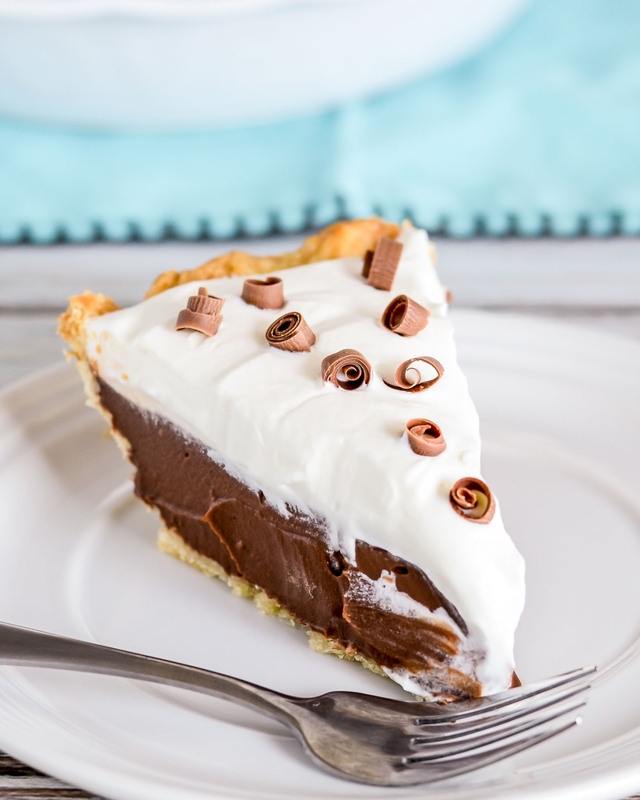 To make this easy chocolate pie, start with a homemade pudding made on the stovetop. 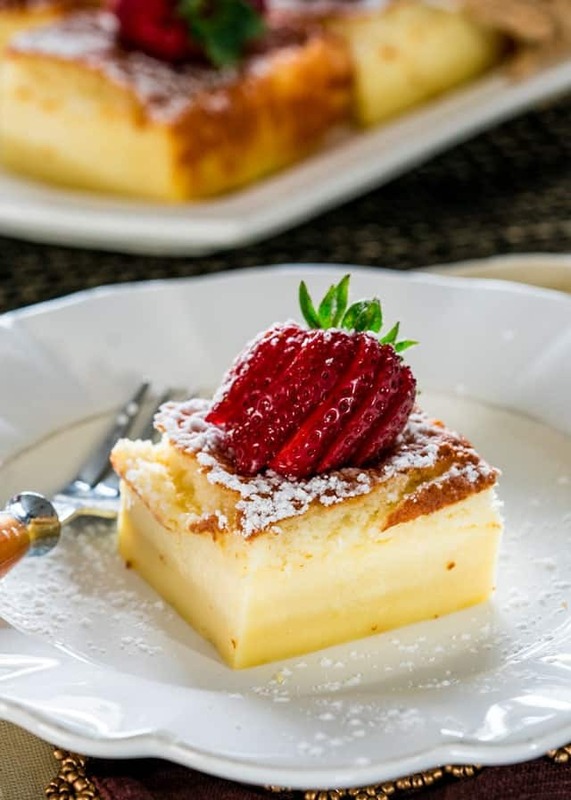 After whisking together the dry ingredients, you slowly whisk in the milk, cream, and egg yolks. Cook and stir the mixture over medium heat till it’s thick and creamy. 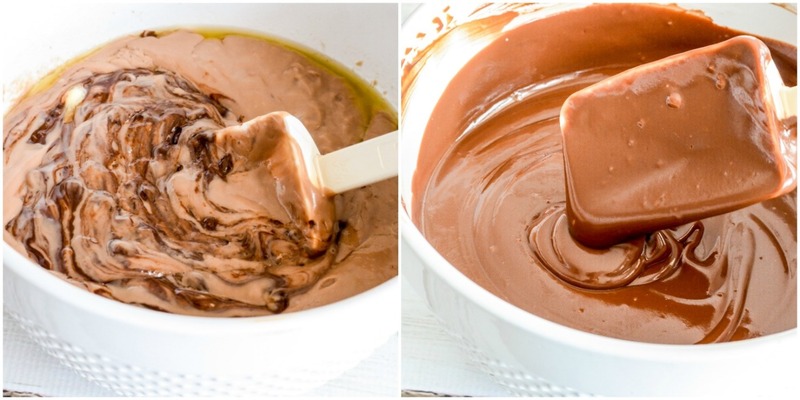 Next you pour the hot mixture over a bowl of butter and chopped chocolate, then stir till it is all melted. That chopped chocolate adds a depth of chocolate flavor, and also helps the pie set up. Stir in some vanilla, and pour it into a pie shell. To finish it off, you add fresh whipped cream and some lovely chocolate curls. 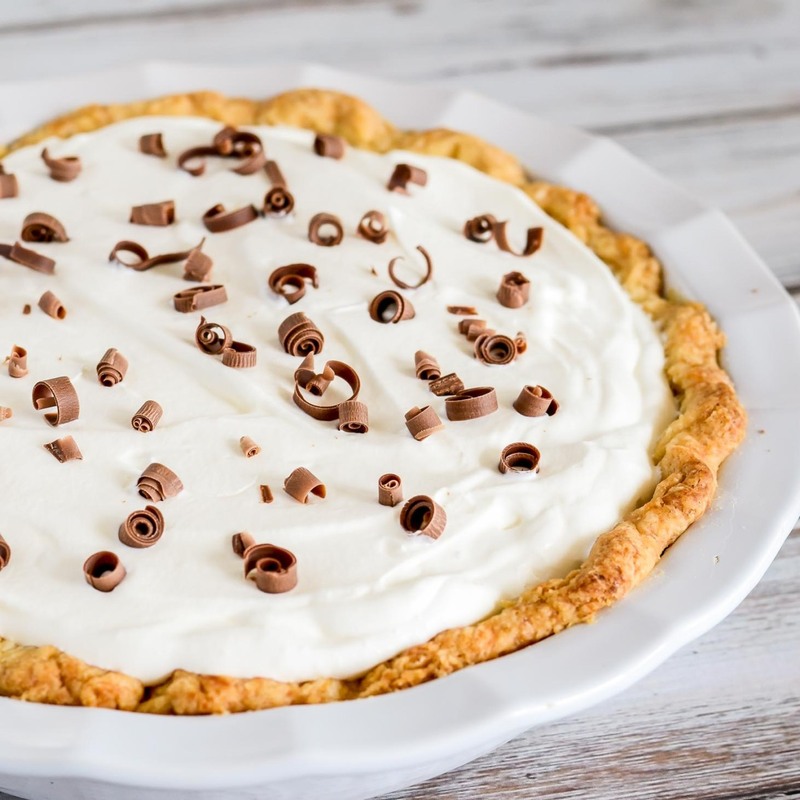 Can chocolate pie be made in advance? you can make this pie in advance and typically make everything but the whipped cream. Store it by covering it in the fridge and right before serving adding the whipped cream and chocolate curls. Can you make this with a graham cracker crust? Yes – and it’s delicious. Just buy a pre-made graham cracker crust at the store. It’s delicious and simple to use and tastes great with this chocolate cream. How long does chocolate cream pie last? Freshly baked, it’s usually good in the fridge for 3-4 days after. Add the milk and whisk till mixture is well blended. Turn heat to medium, cook and stir till mixture comes to a boil. Boil for one minute, stirring constantly. Place a strainer over the bowl of chocolate and butter. Pour hot chocolate mixture through the strainer to remove any lumps. Let sit for a couple of minutes, then stir till butter and chocolate are melted. Place bowl of pudding in a sink of ice water, stir gently for a few minutes till cooled to room temperature. Pour into pie shell. Cover with plastic wrap and chill for several hours or overnight. Just before serving, beat cream till soft peaks form. Beat in vanilla and powdered sugar. Spread over pie and garnish with chocolate curls if desired. Preheat oven to 325 F degrees. 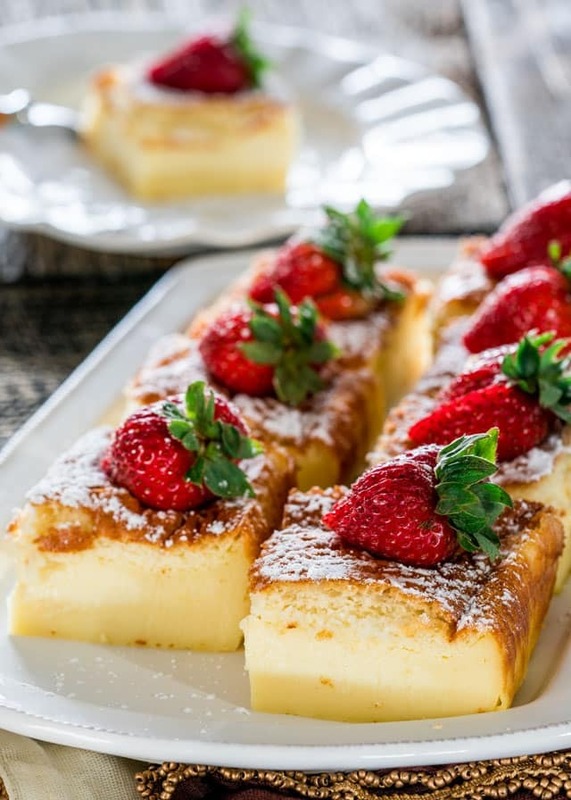 Grease a 8 inch x 8 inch baking dish or line it with parchment paper so that it’s easier to get the cake out. Add the egg whites to the cake batter and gently fold them in. Another variation to folding in the egg whites would be to whisk them in to the cake batter, this is a lot faster and easier. Make sure you don’t fold the egg whites in completely, you still want to see some of the white bits floating at the top. * To get the milk lukewarm, warm it in the microwave for about a minute. The baking time can vary greatly for this cake, depends on oven. Test if after 40 minutes to see what it looks like. 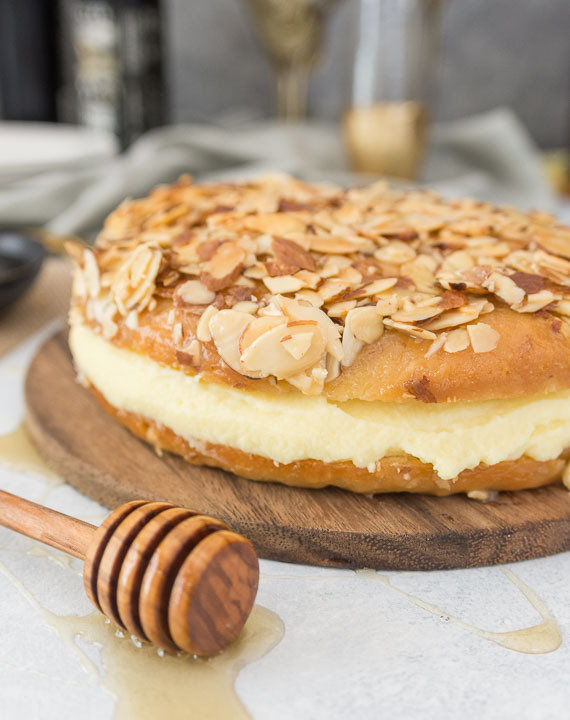 The cake is done when it only jiggles slightly but feels firm to touch. General guidelines for baking at high altitude (not all may apply to this recipe): If baking at altitudes of 5000 feet or higher, keep this in mind: -> Reduce sugar: for each cup, decrease 0 to 2 tablespoons. -> Increase liquid: for each cup, add 2 to 4 tablespoons. 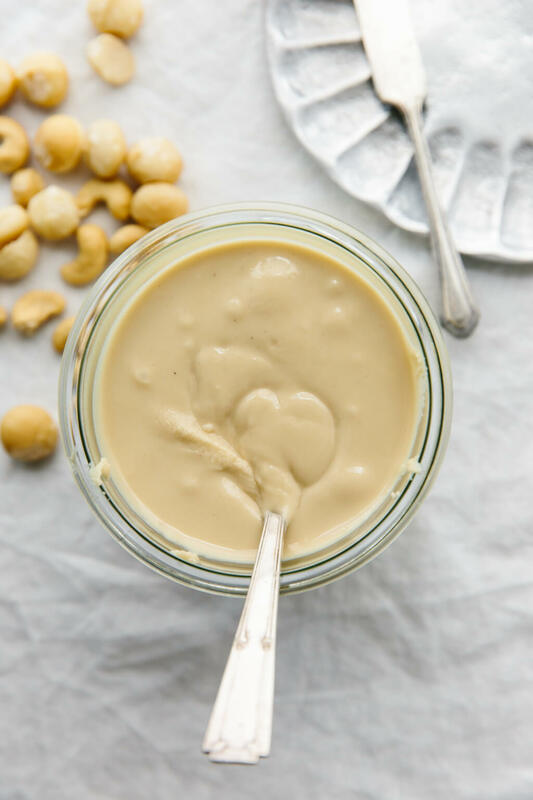 -> Increase oven temperature by 25 degrees F.
Cashews and macadamia nuts are super creamy so you might think that they’d blend faster than almonds, but the opposite is true. They actually take a couple of minutes longer. 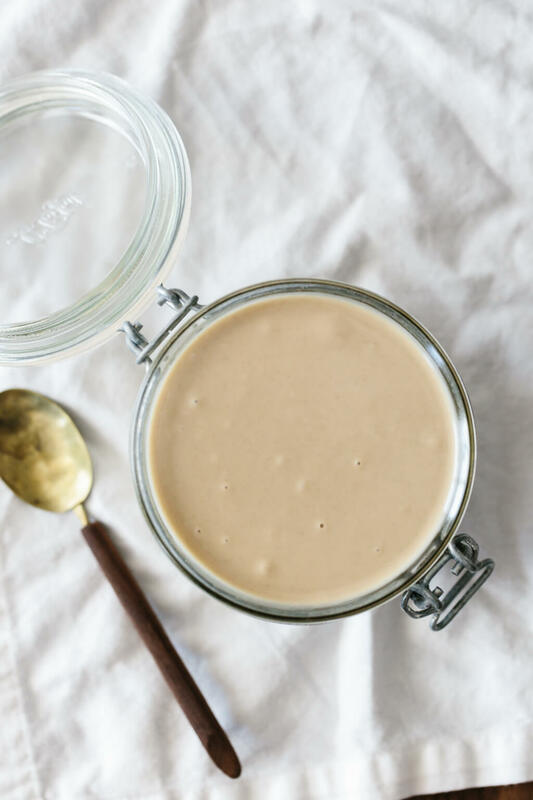 Your macadamia cashew butter will stay super creamy in your storage container and you won’t have to vigorously stir it before using. But, it does take a couple minutes longer to blend. Place the nuts on a large, parchment-lined baking sheet and cook for 10 minutes. Then, let cool to room temperature. Transfer the nuts to your Vitamix and blend on high for 3-minutes, using the tamper to constantly push the nut butter into the blades. 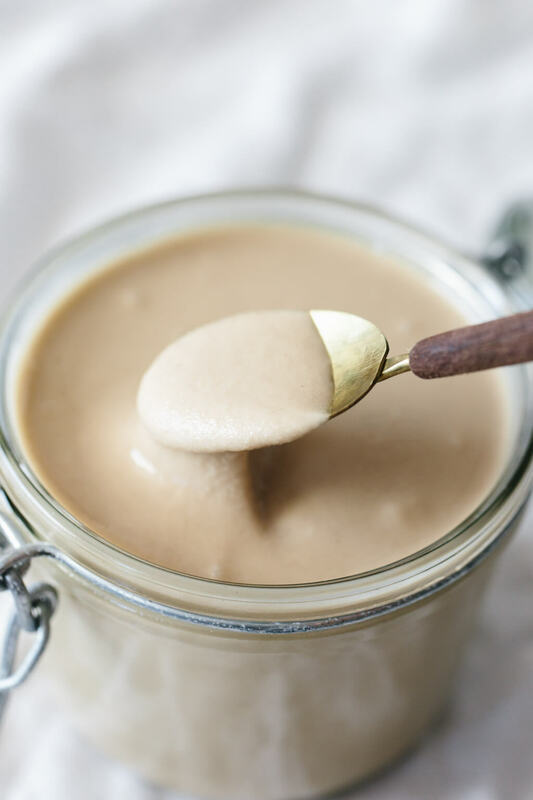 Pour the macadamia cashew butter into a storage container and keep in the refrigerator. 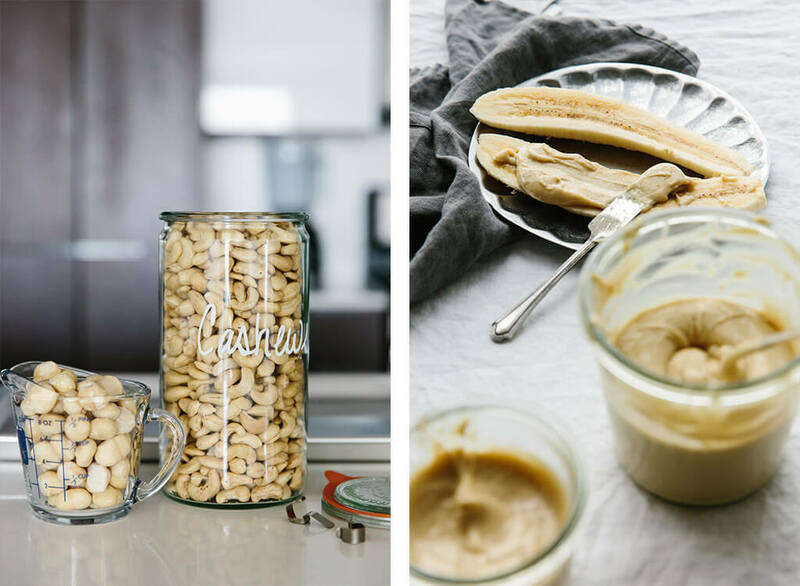 The macadamia cashew butter will stay good for 2-3 months in the fridge. It’s toasted and ground sesame seeds. 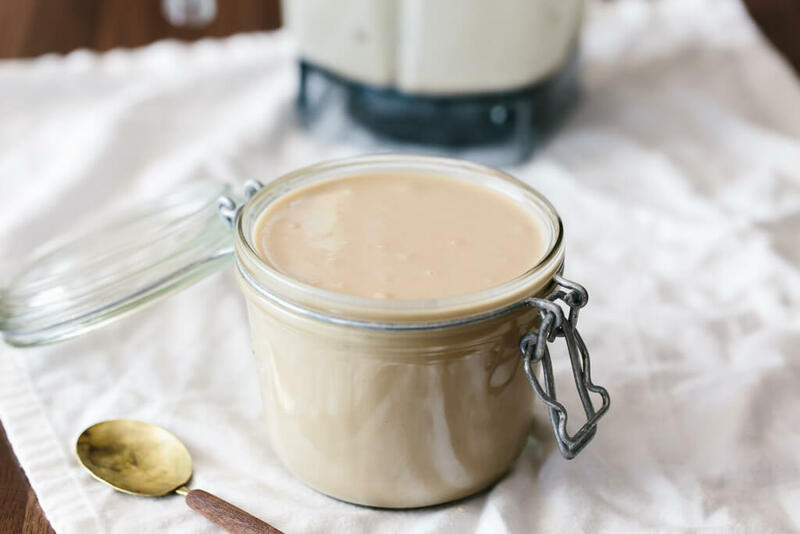 Tahini is a staple ingredient in Mediterranean and Middle Eastern culture and it’s frequently used as an ingredient in hummus or served alongside falafel, pita or babaganoush as a condiment or sauce. Use a high-powered blender. Like Vitamix. 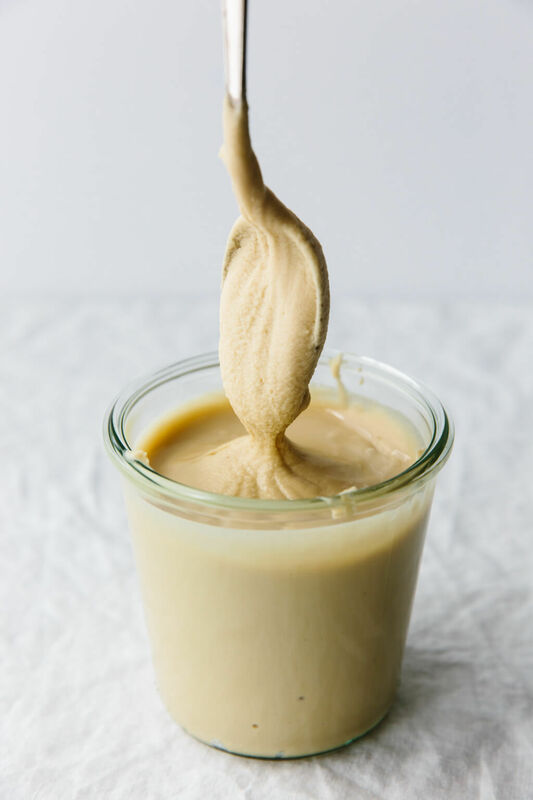 Food processors are great, but they’re just not as powerful as blenders, so can’t deliver the creaminess (without double or triple the oil) that makes for the best tahini. 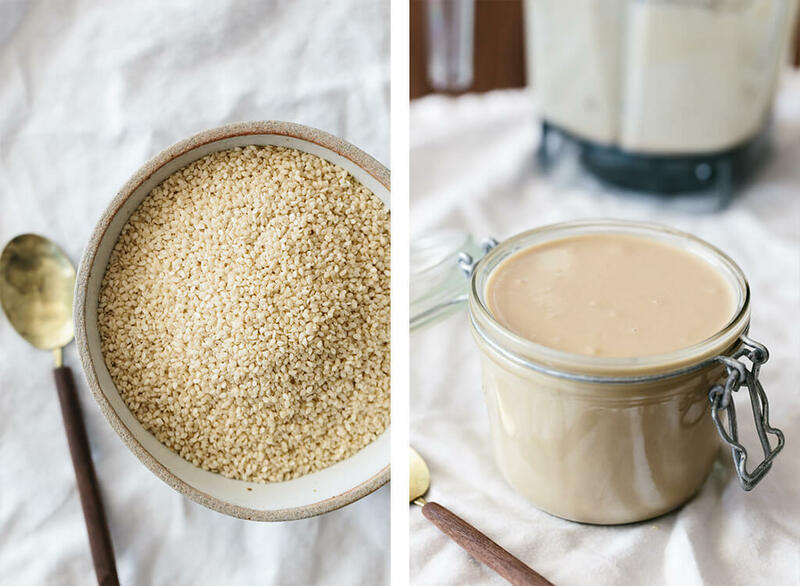 Case in point: when you use a Vitamix to make tahini, you only need 2 tablespoons of olive oil for 4 cups of sesame seeds. If you use a food processor, you’ll use that same amount of oil for 1 cup of sesame seeds. Use a high quality oil, such as olive oil or avocado oil. Just mix the coconut milk, coconut sugar and salt and simmer for 30-40 minutes, stirring occasionally. You will have to watch it more closely towards the end, but that’s it. 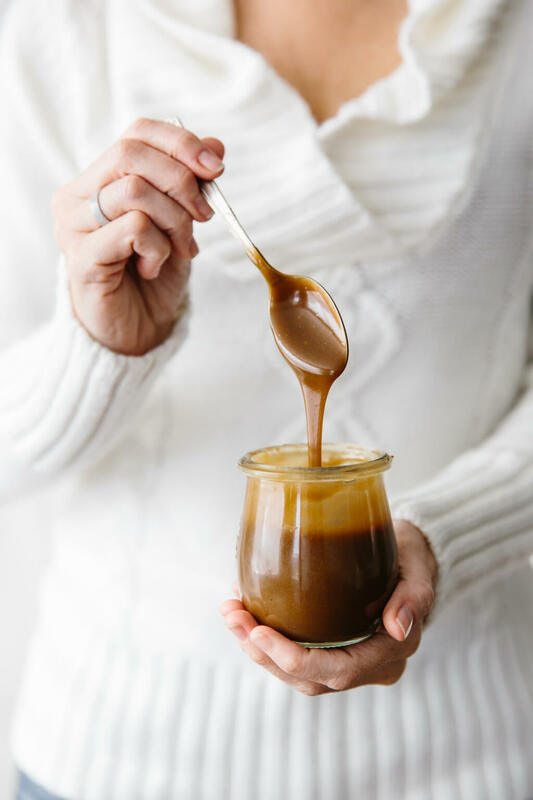 Then, remove from the heat, add the vanilla and coconut oil and there you have it….the most divine salted caramel sauce. 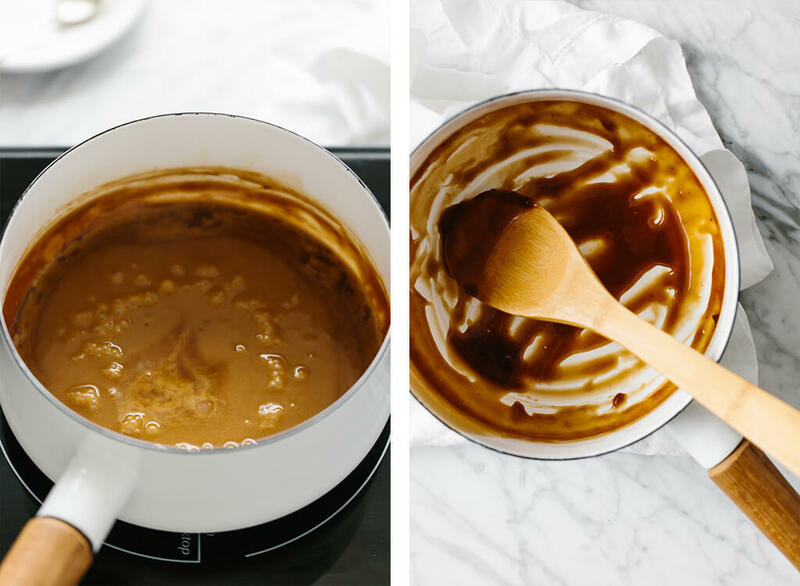 Cook until it coats the back of a spoon and tastes caramel-y. It will still be fairly liquid on the stove, but will thicken slightly as it cools. The cooking times will vary widely based on the brand of coconut milk used as well as stove temperature and climate. So for your first time making this recipe, just cook it slowly on a simmer and let it do it’s thing (on it’s own time). 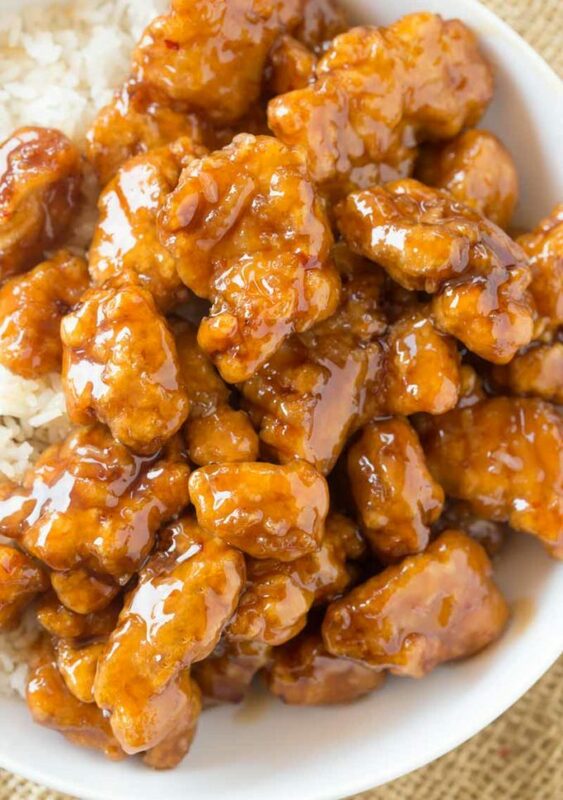 No need to rush this gorgeous sauce. The reward is worth the wait. Combine the coconut milk, coconut sugar and salt in a saucepan over medium-high heat. Bring to a boil (keeping a close eye on it, as it can quickly boil over), then immediately lower the temperature, keeping the sauce at a light simmer. Simmer for 30-40 minutes, stirring occasionally. 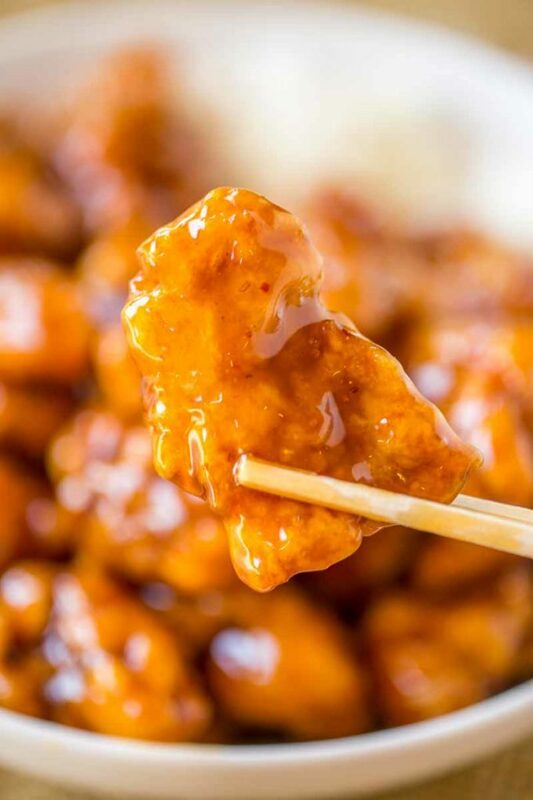 As the sauce reaches the last 5-8 minutes of cooking time, stir more frequently to incorporate the darker caramel bits from the bottom into the sauce. Once the sauce has turned a dark amber and has thickened to coat the back of a spoon, remove from the heat and stir in the coconut oil and vanilla extract. The caramel sauce will stay good for about 2 weeks in the refrigerator. Yes. You need to make it in advance. 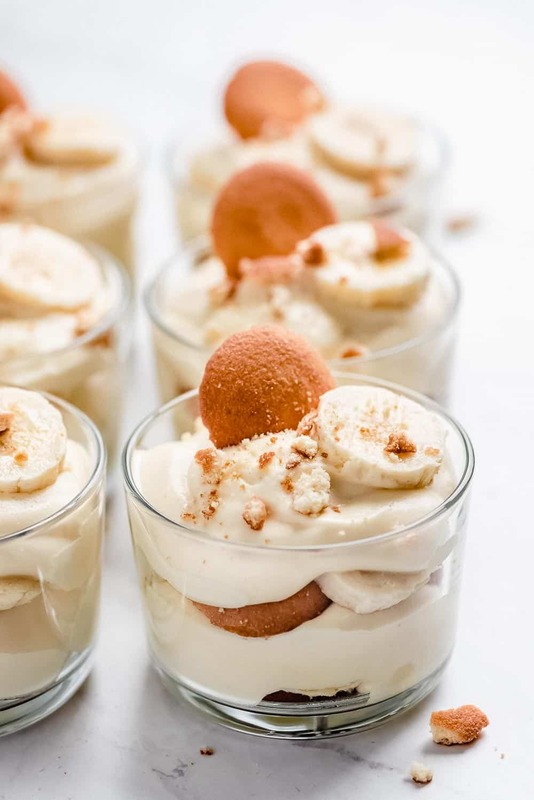 The actually pudding part of this dessert needs time to thicken in the fridge so it is best to begin this dessert a night or two before you plan to serve it or in the morning at the latest if you are serving it at night. While this particular step needs to be done in advance, the assembly of the dessert should only be done 4-8 hours in advance. It really is that simple. The end result is fall-off-the-bone tender, succulent meat. Guinness is a classic Irish stout with a deep dark brown color topped with a rich, dense head when poured. While the color may intimidate you, the flavor is surprisingly light. If you would like to substitute the beer in this recipe, you can try to stick to Irish stouts. 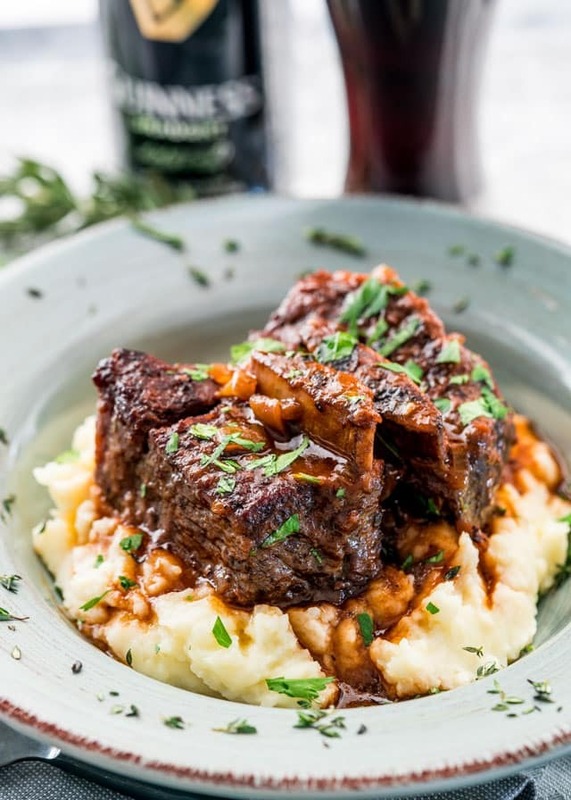 Another way to braise short ribs is to use a red wine such as a Cabarnet Sauvignon, Shiraz or a Zinfandel. Transfer to the oven and braise: Place the pot in the oven and cook for 2 ½ to 3 hours, until the ribs fall off the bone. 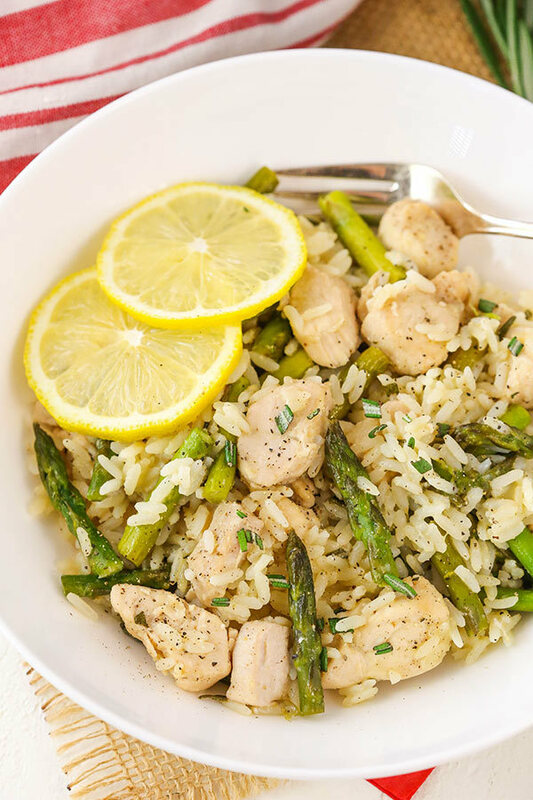 – you can serve this over mashed potatoes, it’s also amazing over pasta, polenta, or even on its own. 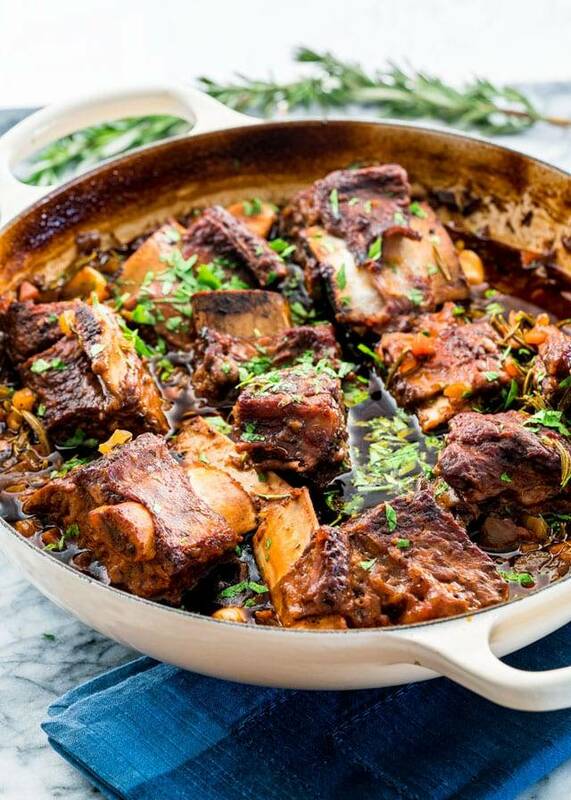 – You can use pork ribs in this recipe if you prefer. Salisbury steak is really a steak made from ground beef and served with a gravy or brown sauce. If you’ve never had salisbury steak before, it’s just ground beef with condiments but it’s shaped to resemble a steak and it’s usually served with gravy along with mashed potatoes or noodles. If you want to go the healthier route with this recipe, you could bake the meatballs. 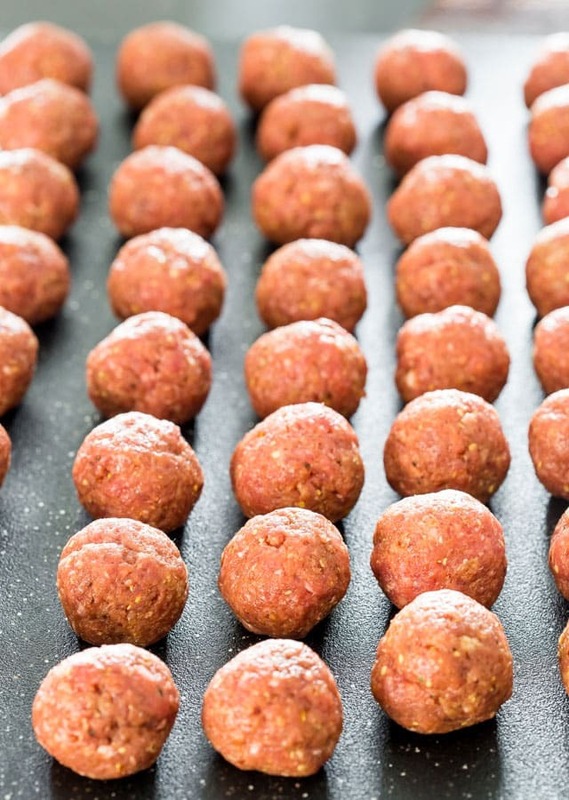 To bake meatballs, coat a baking sheet with cooking spray, or use a baking rack. Bake at 375 F for 30 minutes until golden brown. Add the olive oil to a large skillet and heat over medium to high heat. Add meatballs and cook. If you’re using a large skillet all meatballs should fit in one batch otherwise, you might have to fry them in a couple batches. Cook the meatballs on all sides, add more oil if needed. 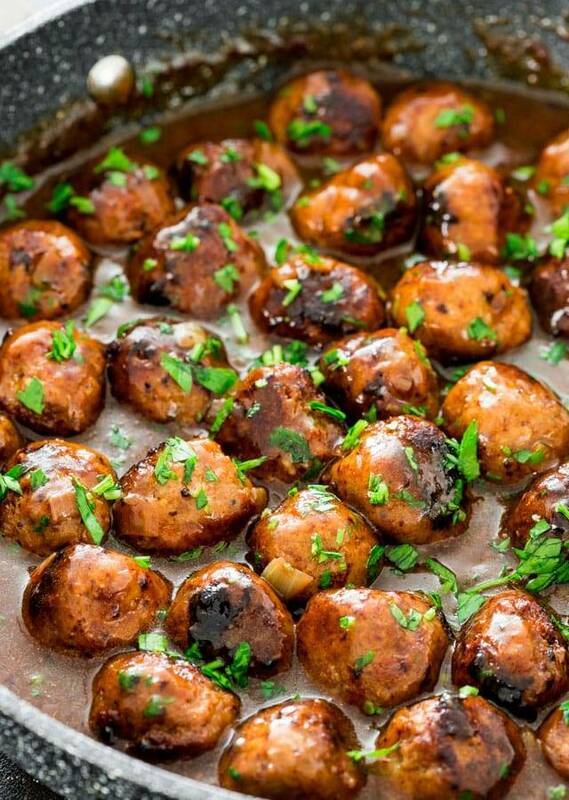 Remove meatballs from skillet and set aside. When the gravy is done add the meatballs back to the skillet and toss them around so they’re covered in the gravy. Garnish with parsley. 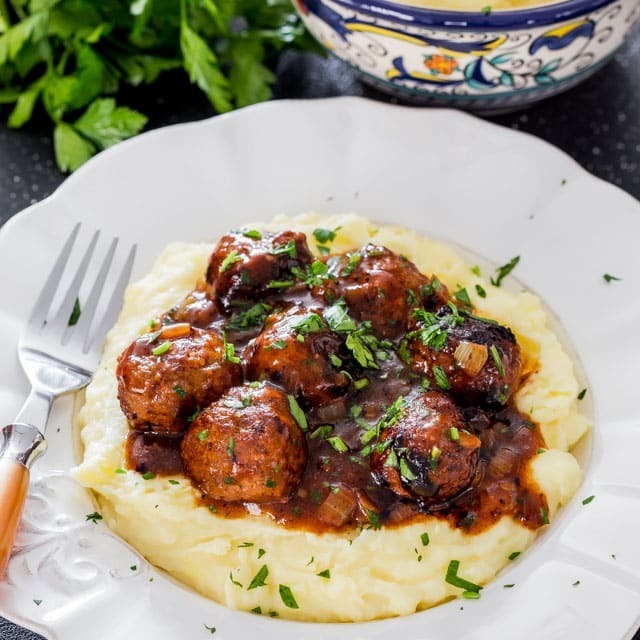 – To prevent your meatballs from crumbling and falling apart, do not overcrowd your meatballs while cooking them. Leave about ½ inch of space in between. It’s best to do it in a couple batches. It can also be an issue with the binding, so either not enough egg or too much breadcrumbs, if your eggs are too small, add another egg, that should help bind the meatballs better. Then all that’s left to do is to simply roll out the dough and fill with the spinach filling, more Parmesan cheese and lots of feta cheese. 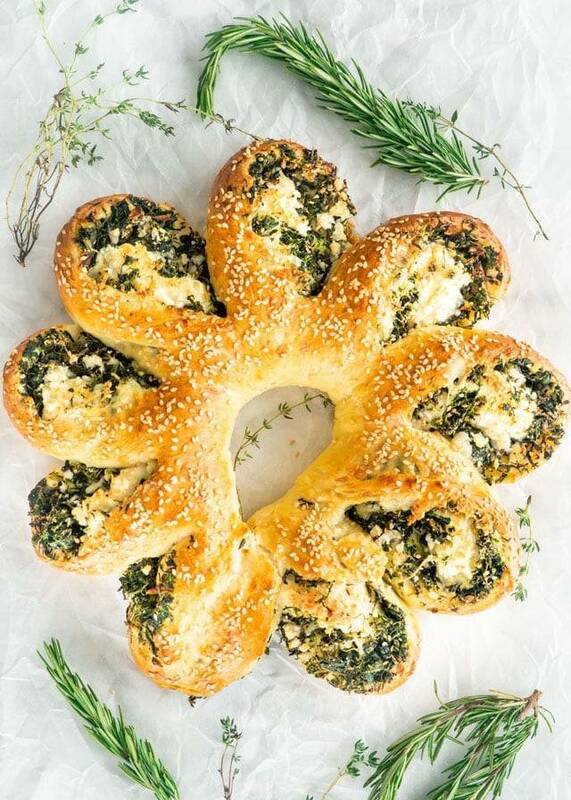 You can roll this out and cut it in slices and bake it like you would bake cinnamon rolls, or form it into a wreath like in the recipe. Add the spinach and cook, stirring occasionally, for an additional 2 minutes. If your spinach is watery, this is the time to squeeze out additional water, however, if you do it before adding it to the skillet, there shouldn’t be any excess water. Flour your work surface well, place the dough on your work surface and knead it gently until smooth, adding more flour as necessary. 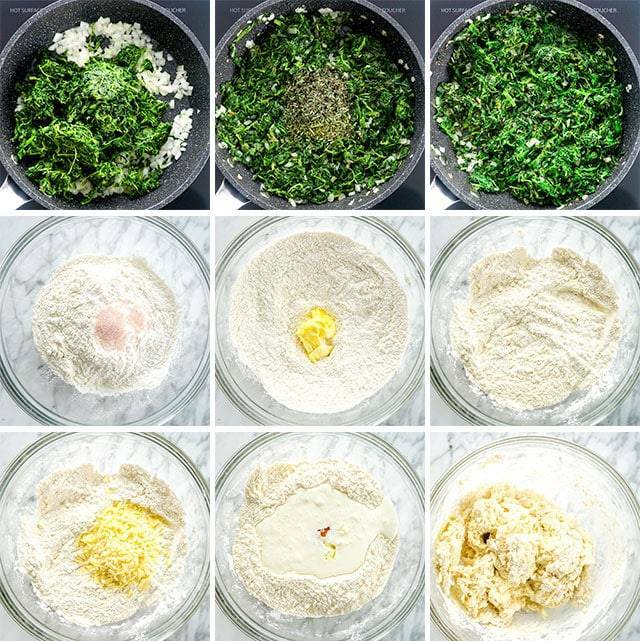 You can add another ¼ cup of flour, until the dough no longer stuck to your hands. Keep in mind it’s a soft dough. Roll out the dough into a square until it’s about ½ inch in thickness. 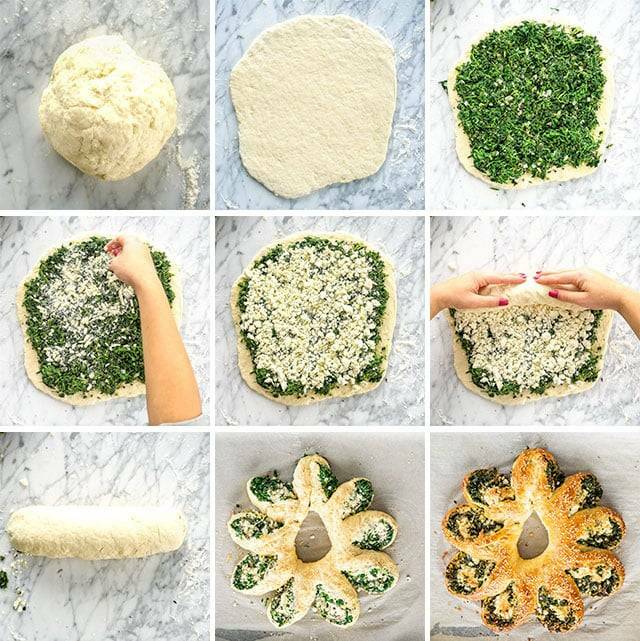 Spread the spinach mixture over the dough, leaving about ½ inch strip along the edges. 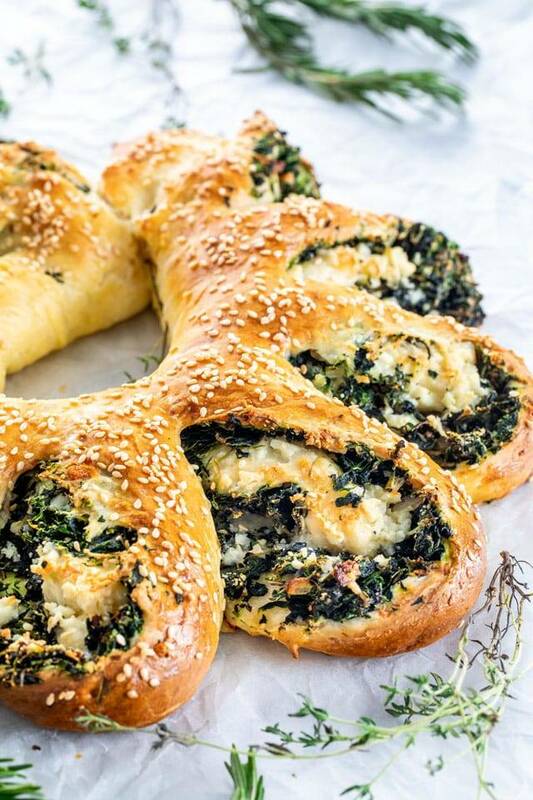 Sprinkle with Parmesan cheese and feta cheese over the spinach. Place the roll on the prepared baking sheet, seam side down. Using scissors or a sharp knife cut 1 inch slices, leaving about 1 ½ inches from the end. Bring the two ends together to form a circle. You could place a small bowl or ramekin in the center to make this easier. Take each slice and turn it over on its side, and repeat with each one, slightly overlapping it with the previous one. – Alternatively, you could cut the roll into 1 inch slice and place them into a greased 9×13 inch baking pan and bake as instructed. and heat it up in the oven. 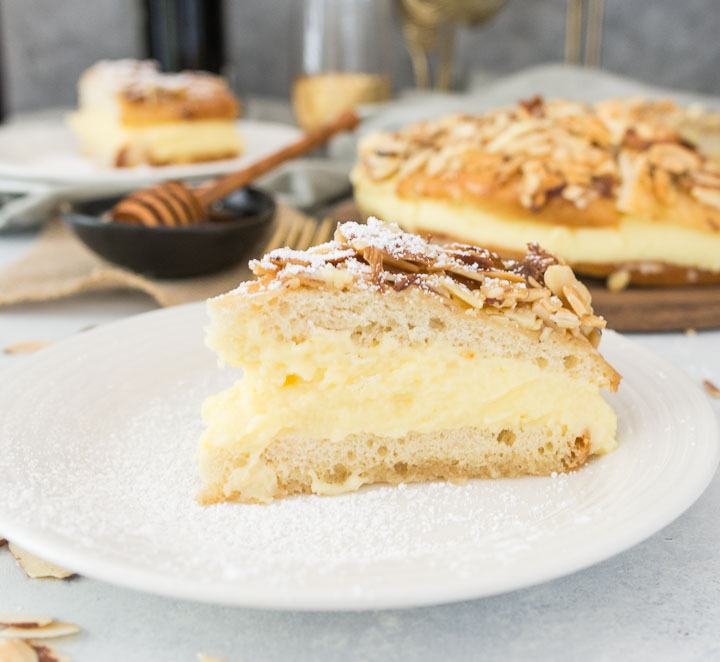 Peaches and Cream Strudel wrapped in puff pastry with a cream cheese and peaches filling and topped with toasted almonds. Preheat the oven to 375 F degrees. Line a baking sheet with parchment paper and set aside. Prepare the peach filling first by adding the peaches and ¼ cup of sugar to a smaller pot and cook over medium heat for about 3 to 5 minutes just until all the sugar dissolves and the peaches soften a bit. Remove from heat and strain if there is too much liquid. In the bowl of your mixer add the cream cheese and mix until smooth. Add the sugar, vanilla extract, egg yolk to the cream cheese and continue mixing until well combined and smooth. Using one puff pastry at a time, place it over a lightly floured surface and roll it out into a 14×12 inch rectangle. Cut slits 1 inch apart from the 2 sides of the puff pastry about 1/3 way in, as seen in the video. Spoon about half the cream cheese mixture down the center of the pastry and smooth it out. Next add half the peaches over the cream cheese mixture. Starting at one end, fold the pastry strips over the peach mixture, alternating sides until you completely cover the peach mixture. Repeat with remaining puff pastry and ingredients. 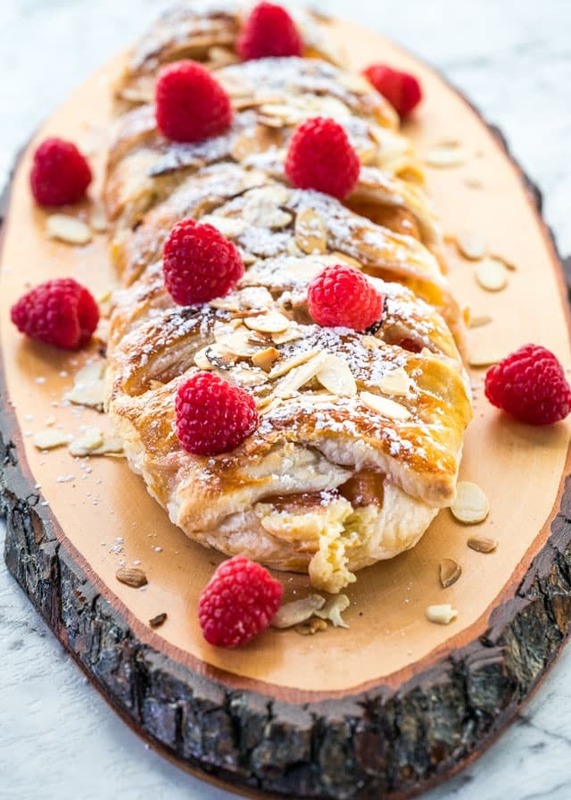 Place the peach strudels onto the prepared baking sheet and brush with the egg wash. Place the baking sheet in the oven and bake for 30 to 35 minutes or until the strudels are golden brown. 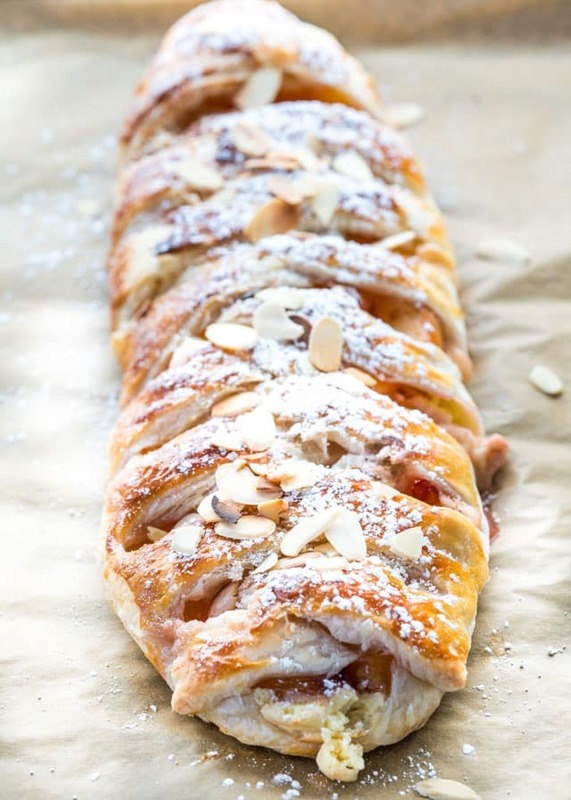 Let the peach strudels cool down for about 5 minutes then dust with icing sugar and top with toasted sliced almonds, if preferred. This recipe will yield 2 peaches and cream strudels. 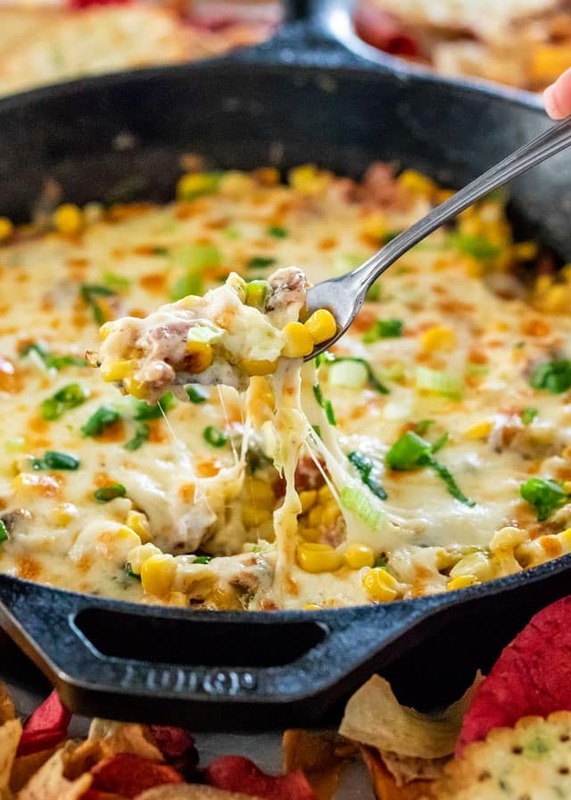 This Bacon Corn Dip is creamy, cheesy, spicy and simply decadent. Try to use fresh corn on the cob versus the canned or frozen corn. However, don’t stress if it’s not the season and you can’t find fresh corn, frozen or canned will be just as good. When cooking the corn, the secret is to cook it until thoroughly golden and looks almost charred. Alternatively you can grill your corn for the same effect. Choose a good cheese and shred it yourself. 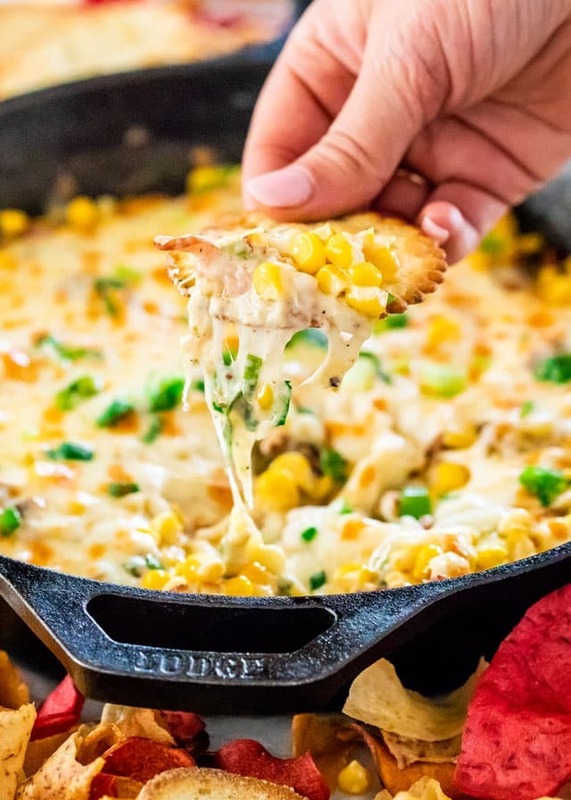 You can use fresh mozzarella cheese in this dip for that extra stretchy cheese, but Monterey Jack, provolone, gruyere or even Swiss cheese would work great. Just shred it yourself. Mayonnaise is key in this dip to make it extra creamy. Replacements or additions could be sour cream or even cream cheese. 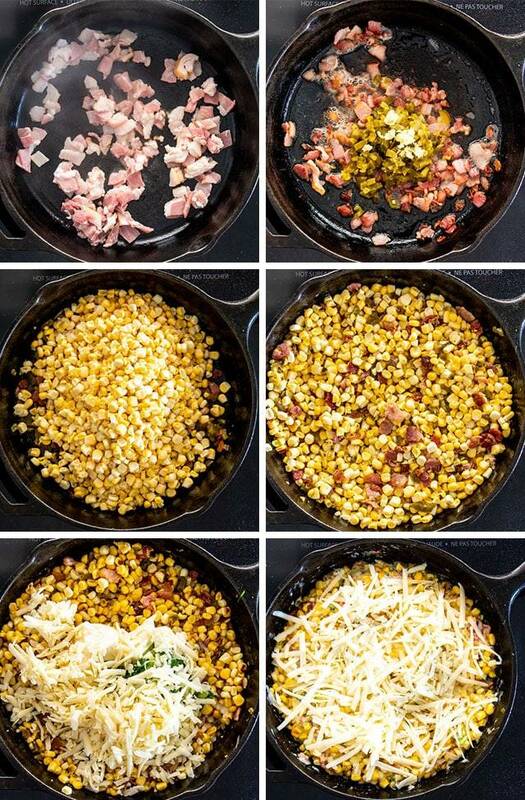 Add the chopped bacon to a large oven safe skillet and cook until browned and crispy. Do not drain the fat. Stir in the jalapeños and garlic and cook for 30 seconds or until the garlic is aromatic. Stir in the corn and cook, stirring occasionally, until the corn is golden and starts to char. Should take 3 to 5 minutes. 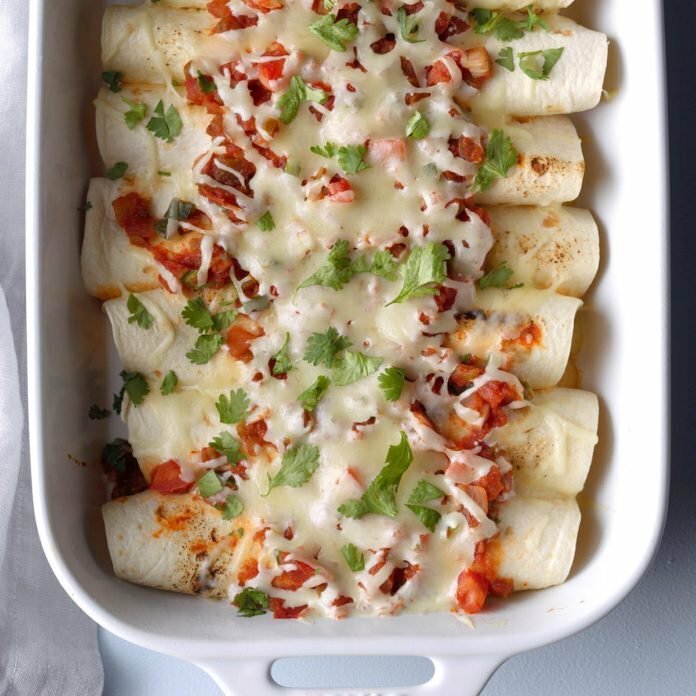 Add the mayonnaise, green onions and 1 ½ cups of the mozzarella cheese. Stir everything together well, then season with salt and pepper as needed. Top with remaining mozzarella cheese then place under the broiler for 3 to 5 minutes, until bubbly and golden brown on top. Top with more green onions or other herbs like cilantro if desired. Serve hot with tortilla chips or crackers. * The pickled jalapeños here are used were quite spicy, so if you prefer less spicy, you can used canned green chiles instead. Also fresh jalapeños will work as well in this recipe. * Other cheeses that would work well would be Monterey Jack cheese, provolone or gruyere cheese. * This bacon corn dip can be made ahead of time. Simply do everything up to and including step 5, then let it cool. Once cooled cover with plastic wrap or aluminum foil and keep in the refrigerator until ready to pop in the oven and broil. Anonymous asked: I found another recipe for the stew and it says to add the chickpeas after the root veggies. Reason being the chickpeas are canned so you’re really just warming them up. If they cook to long they’ll lose their texture (mushy peas).